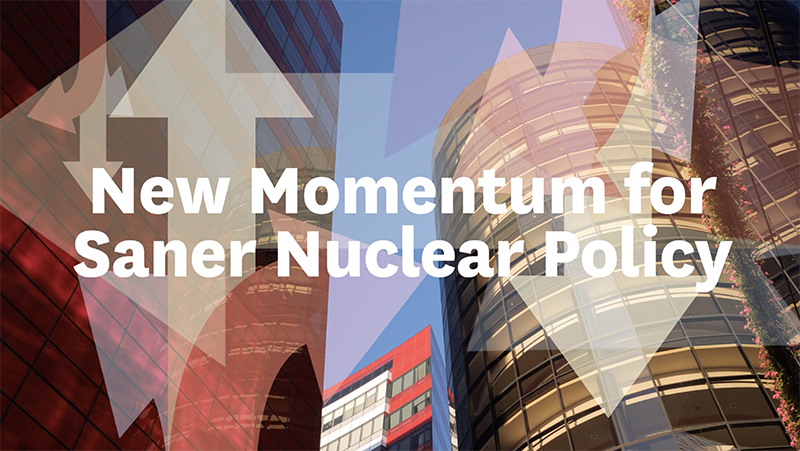 Elizabeth Warner, director of development for Ploughshares Fund, served as moderator for the event, "New Momentum for Saner Nuclear Policy," held March 18 at the Pacific Design Center's SilverScreen Theater in West Hollywood. Also in attendance as special guests were TV writers and producers to talk about depictions of nuclear risks on TV: Paul Redford, writer/producer (The West Wing, The Newsroom, Madam Secretary, Designated Survivor); David Grae, writer/producer (Madam Secretary, Gilmore Girls, Castle); Lila Byock, writer/producer (The Leftovers, Manhattan, Castle Rock); and Sam Shaw, creator/showrunner/writer (Manhattan, Castle Rock). While there was plenty of hope carried in the comments about organizing, growing grass-roots arms control movements, and a new wave of leaders committed to the fight, it was probably pretty hard for the 150-plus guests listening in the audience to ignore a sense of apprehension. "We have a lot to worry about," Benedict told them. "Climate change and nuclear weapons are really the two existential threats we face as a planet. Of the two, nuclear [destruction] can happen in an afternoon." The experts and policy-makers—Benedict, Lieu, Rhodes and Ploughshares president Joe Cirincione (who delivered opening remarks)—all seemed to be on the same page when talking about nuclear policy. They spoke about how the framework to control these weapons is broken, with longtime treaties and agreements being abandoned or unraveling, and about the fact that a president's order to fire nuclear missiles can't be countermanded—not by the secretary of defense, or Congress, or by any member of the president's cabinet. "The current U.S. policy has failed," Cirincione said, calling out the withdrawal from an agreement that contained Iran's nuclear program, the recent missed opportunity with the summit in North Korea, and the decision to suspend President Reagan’s 1987 Intermediate-Range Nuclear Forces Treaty (INF) that was made with the then-Soviet Union. "It's made every single one of the nuclear threats worse." Making matters more challenging is that most Americans remain largely mystified over their own country's nuclear policy, and what's at stake. She said the race to "modernize" arsenals that's going on in countries like Russia, China, the UK, France, India, Pakistan and the U.S. really means increasing the number of weapons, their killing power and their precision. The U.S. alone plans to spend nearly $500 billion over the next decade maintaining and upgrading the country's nuclear storehouse. Rhodes, a political commentator and co-host of Pod Save the World, played a role in the 2015 nuclear arms agreement with Iran, now abandoned by the current U.S. administration. Rhodes said the agreement—which took seven years of negotiations—demonstrated that diplomatic solutions can solve these problems. Under President Obama, Rhodes said, U.S. non-proliferation efforts were two-fold: reduce the number of weapons, and stop the spread of nuclear technology. Yet he added that the Obama Administration’s achievements at the time in nuclear control were restrained by Congress, who pushed back against any cuts in funding for nuclear development. “There’s a synergy between the Department of Defense and some members of Congress,” who see the nuclear infrastructure as a “jobs program in some places,” he said. Michael Douglas traced his awareness about nuclear issues to The China Syndrome. Douglas traces the start of his involvement in nuclear issues to his role in the 1979 film The China Syndrome, which he also produced. The movie’s storyline about a near catastrophe at the fictional Ventana nuclear power plant in California was researched with the help of two experts, he said. Just several days after the movie opened, real life imitated art when one of the reactors at Three Mile Island in Harrisburg, Pennsylvania had a partial meltdown, releasing radiation. Douglas was struck by how the problems at Three Mile Island were closely similar to the film’s sequence of events. When the discussion steered toward how Hollywood can take a leading role in raising awareness on nuclear risks, Douglas, an advisory board member for Ploughshares, referred to the growing influence of the climate change movement, which has accelerated because of the worldwide images of melting glaciers, super storms and flooding being seen on the news. He said entertainment’s depiction of critical issues such as the nuclear threat can have a strong impact on getting people involved. "I worry most about apathy," Douglas said. "[Since Obama] we've fallen off a cliff." Still, the actor cautioned against Hollywood delivering messages to audiences, adding that the role of entertainment is to first entertain, with great characters and stories. Shaw, creator of the show about the race to develop the atomic bomb, said the origin story still explains some of the challenges that we're grappling with today as a nuclear power—national secrecy, tradeoffs between freedom and security, and the politicalization of science. "Codes and strictures and secrecy that were part of the Manhattan Project were metabolized by the country," Shaw told the audience and panel. "We still don't know how to talk about these issues." In TV shows like The West Wing and Madam Secretary, Redford said a great deal of the drama and conflict involved is ultimately set against writing for a character—the president—who lives day and night with the stark realization that they have the power to end the world. "How do they deal with that?" he said. So where are the signs for this new momentum? Perhaps it was when Lieu spoke about legislation he introduced (along with Massachusetts Sen. Ed Markey) that would restrict a president's ability to launch a nuclear first strike without authorization from Congress. Or Cirincione pointing to the wave of newly elected Democratic members of Congress, many of them women and many self-identified as activist leaders who are connected to outside movements committed to resetting U.S. nuclear policy. The new momentum could be seen embodied in someone like Yasmeen Silva, who at a young age brings her already formidable organizing experience working on issues like human rights, women's rights and environmental justice to the non-proliferation cause. Rhodes reminded everyone that there's an urgency surrounding this issue. He recalled visiting Hiroshima with Obama in May 2016—a motorcade through the streets packed with thousands of people. In his speech, the president paid tribute to "the voices of the hibakusha [blast survivors]." "In the middle of the city [once obliterated by an American atomic bomb], I realized that unless the current trajectory is changed, this will happen again," Rhodes said. "It's up to us as citizens to break the cycle of inevitability."